In this occasional series of reports from country house hotels and restaurants, Tom Cannavan makes his way to Perthshire in Scotland and The Roman Camp, a 20-bedroomed hotel with wonderful old walled gardens that sits on the banks of the River Teith. It’s easy to miss the entrance to The Roman Camp which is off the main street of the busy little town of Callander. But as you turn into the tree-lined driveway of the 20-acre estate you instantly forget the 21st century hustle and bustle. Originally built as a hunting lodge in 1625, the Roman Camp was converted to a hotel in 1939 and has been run by Eric and Marion Brown since 1989. The Roman Camp takes its name from remains that can be seen to the south of the gardens, dating from the 1st century AD when the Romans set up a line of defences against the highlanders, to protect their lowland conquests. 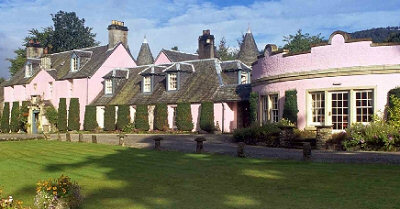 The building has a fascinating history, constructed by the Earl or Moray, and being home to Reginald Brett, 2nd Viscount Esher, who extended and re-modelled the house extensively, including the addition of the extremely beautiful garden set within a curve of rubble walls embellished with a marble wellhead of the Romanesque period and an elaborate columnar sundial. Today, the hotel has a reputation for its food, its architecture and its setting. The extensive walled gardens make for a diverting hour of strolling around, and many other little paths lead to the riverbank, where you might glimpse the resident peacocks strutting about and will pass many pieces of Italian statuary added to the house in the late 19th century. As the hotel is also less than one hour from Glasgow or Edinburgh, The Roman Camp is one of the most popular wedding destinations in Scotland, with weddings most weekends throughout the summer. That, of course, is a double-edged sword for the non-wedding visitor. The hotel is full of old-world charm, such as the drawing room above with its over-stuffed sofas and orginal silk wall-covering, where afternoon tea or pre-dinner drinks are taken. Wood-panelling and low 17th century ceilings feature in other parts of the house, as do welcoming open fires. I arrived one late summer evening, whilst a wedding party from that day was just finishing its meal. That meant the reception area was busy, staff slightly distracted though perfectly pleasant, but one couldn’t escape the feeling of gate-crashing a private function. That also meant the main dining room was out of action that evening, so we ate in a slightly characterless side room. I spoke with owner Eric Brown who told me they tried as much as possible to have weddings only on alternating weekends and that the ambiance of the hotel was much more ‘country house’ than wedding venue at other times. But it is something you might well wish to double check when booking. Rooms are also very traditional, though extremely comfortable and well appointed with bottled water and fruit, as well as coffee and biscuits. Our room featured a separate little sitting room and a large bathroom that had obviously been recently modernised, with walk-in shower and free-standing bath. The Roman Camp’s restaurant has always enjoyed an excellent reputation. 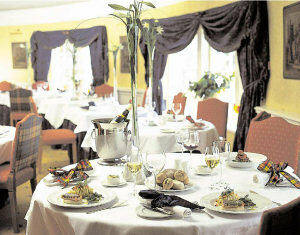 The style is definitely ‘fine dining’, but using local ingredients and with nods to Scottish culinary tradition. We settled into the comfortable chairs of the overspill dining room, having already perused the menu over a glass of Champagne and canapés in the drawing room. Our fellow guests seemed mostly to be residents on this occasion, though the set five-course dinner at £47.00 and à la carte at around the same cost are popular with non-residents too. A little amuse of a melon shot with a Pimms foam was delightfully fresh and tasty, and then came a basket of good breads included a malted soda bread and excellent sourdough rolls. Highlights of the meal included seared Scottish scallops which were expertly cooked to a golden crisp outside, with soft, yielding texture in the mouth. A little lightly-curried velouté sauce also sported tiny fragments of candied hazelnut, which was a clever way of adding subtley nutty flavours that matched the scallops, pin-points of sweetness and a bit of textural crunch. My main course of Scottish venison was also cooked extremely well, with each component of the dish carefully thought through and the flavours vivid and refined. Desserts (inlcuding a delicious little vanilla and raspberry pre-dessert) were superb too. The wine list here is a good one, with plenty of splash-out big names for those so inclined, but we were happy with a half bottle of house Champage and another half of Charles Joguet’s Chinon Cuvée Terroir from the ripe 2003 vintage at around £30. Taking cofee and petit fours back in the drawing room, I considered my first impressions of The Roman Camp. There is absolutely no doubt the food here is of an extremely high standard. The kitchen is serving very sophisticated, very refined cuisine, and the ever-changing menu reflects the best of the season. 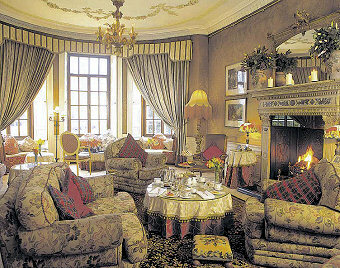 The service in the dining room was also impeccable, the wine list was good and – once the day’s wedding guests had departed – the whole hotel exudes a feeling of cosy, familial warmth: it doesn’t have the air of a grand or imposing country hotel, but of a rambling and welcoming family home.Right: the main dining room. But that dichotemy between this hotel’s dual personalities as upscale restaurant with comfy rooms and more glitzy wedding venue catering for large parties does create some tensions. Breakfasting in the main dining room next morning was a slightly odd affair, with the tables and decorations giving the feeling of a function suite, kitted out with enormous and slightly incongruous (for a breakfast table) vases of flowers on each table. I think the Brown’s manage this split personality as well they can, but when I return to the Roman Camp (which I’m keen to, for the food alone), I’d prefer to do so when laid-back charms of this historic old house are not interrupted by someone else’s wedding celebrations. Rooms from £145 for two, dinner from £47 per person.